Prepare a large bowl of nachos or pita bread for lots of hummus dipping action! 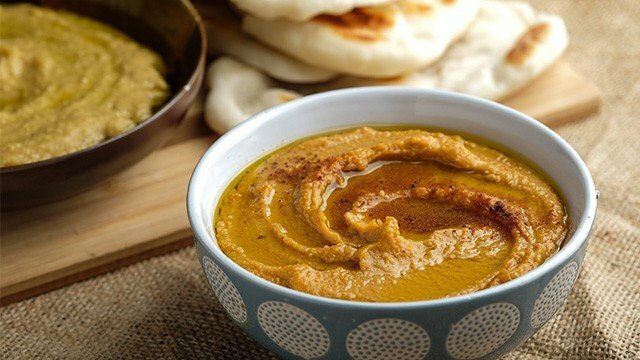 This hummus is made with both chickpeas and seeds, giving it lots of flavor! Plus, there is no cooking required to make this tasty dip. Serve it alongside generous servings of toasted pita bread or chips. For a healthier option, cut carrots and cucumbers into sticks and serve them on the side. Try these exciting hummus variations for a change! Place nuts, chickpeas, garlic, and chickpea water in a food processor or blender. Process until smooth, thinning mixture with olive oil (reserve 2 Tbsp. for later use), until desired consistency is reached. Adjust seasoning with salt, ground pepper, and lemon juice to taste. Transfer to a container, and cover top with reserved olive oil. Chill until ready to serve with carrot and cucumber sticks.